If you weren’t able to attend SHOT Show last week, you can still read the Digital editions of all four issues of SHOT Daily, the magazine printed each day of the SHOT Show. You’ll find some interesting product announcements in the SHOT Dailies, plus late-breaking gun industry news. 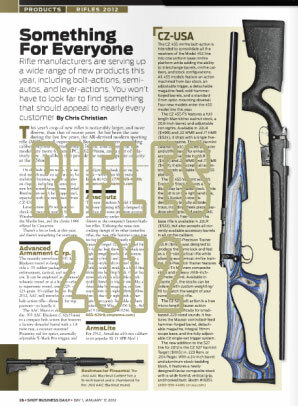 The DAY 1 edition features the annual round-up of new firearms, while the DAY 2 edition highlights new-for-2012 optics. 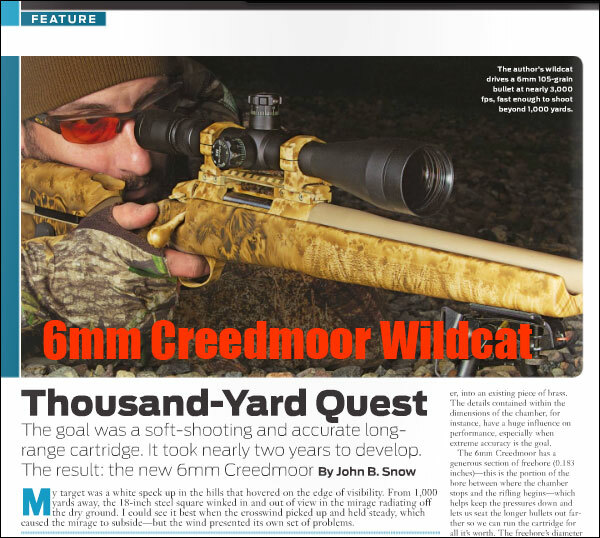 On Pages 20-23 of the Day 3 edition, you’ll find an interesting article by John Snow on a 6mm Creedmoor wildcat (6.5 Creedmoor necked down — see below). The final Day 4 edition includes a guide to .375-Caliber big game cartridges, along with coverage of the latest Air Gun technologies. The 2012 SHOT Show Dailies are available online at Shotbusiness.com and the SHOT Show Blog, or just click the links below. You can read the Digital Editions online, or download PDF versions to your computer. NOTE: The PDFs are very large files, slow to download. Share the post "SHOT SHOW: Download Digital SHOT Dailies for Free"